How we might best protect and promote the human right to freedom of religion—under Australian law, in our public sphere, and for the common good of all Australians. 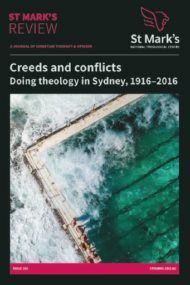 This edition of St Mark’s Review brings together some of Australia’s leading legal thinkers and theologians to address the vital issue of religious freedom in contemporary Australia. In the wake of both vociferous public debate and the Australian government’s recent acceptance of the majority of recommendations made by an Expert Panel’s ‘Religious Freedom Review’ (May 2018), contributors to this edition of the journal reflect on how we might best protect and promote the human right to freedom of religion—under Australian law, in our public sphere, and for the common good of all Australians.